Some historians have called it â€œIBMâ€™s first personal computerâ€� -- perhaps because, in part, it was known as the Personal Automatic Calculator while in development. Introduced on September 3, 1957, the IBM 610 Auto-Point Computer was â€œdeveloped to meet the need for a fast, automatic and economical tool to assist in solving problems arising in modern science, engineering and business.â€� Among the applications to which the 610 could be applied were matrix arithmetic and the solution of sets of simultaneous equations; integration of ordinary differential equations; electrical network computations; stress and vibration analyses; reduction of test data; polynominal evaluations; statistic analyses; power series evaluations; and actuarial computations. The 610 had 2,604 digits of addressable magnetic drum memory. There were 84 internal registers of 31 digits, each of which could be used as an accumulator. In addition, 6,000 digits of intermediate, automatically re-circulating memory was available through the data tape unit. 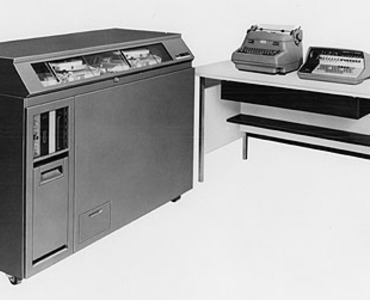 The 610 was made up of three separate units, the largest of which was a cabinet (seen at left) which housed a magnetic drum, the arithmetic control circuitry, a plugboard and separate paper-tape readers and punches for program and data. Cable connected this cabinet to two adjacent desktop units (seen at right). On the right side of the desktop was the operatorâ€™s keyboard for control and data entry. It incorporated a small cathode ray tube on which the contents of any register could be displayed. On the left side of the desktop was an electric typewriter to handle all printed output. On the simplest level, the 610 could be used much as a desk calculator, with manual entry of each instruction and all data. On an intermediate level, the 610 could be programmed to repeat the instructions keyed in by the operator for a simple set of data. And at the highest level, the 610 could operate indefinitely under control of a program, retrieving new data from a second paper-tape reader and outputting the results to the associated data punch and/or typewriter.